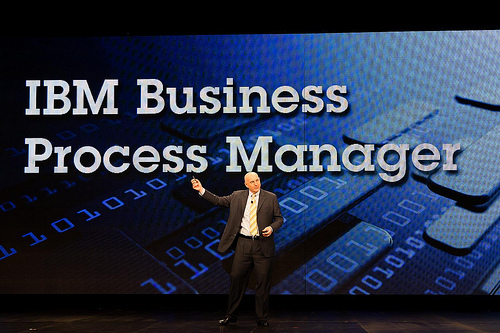 Phil Gilbert, IBM senior vice president, describing Business Process Manager 7.5 at Impact 2012. When I wrote up IBM’s Impact business and technology conference last year I noted that Phil Gilbert is an executive to watch at Big Blue. Progress in the interim confirms the progress he is making. Gilbert, who joined IBM in early 2010 when it acquired Lombardi Software, brings a different perspective to IBM, and he is clearly making an impact on the company’s development culture. I have been an IBM watcher for nearly two decades and I certainly can’t remember hearing an executive from the firm talking so passionately about the need for beautiful software; and more importantly – striving to deliver it. With all the chatter today about the consumerisation of IT it’s easy to forget just how clunky the traditional user experience (UX) of enterprise software is – well, unless you have to use it, of course. In traditional IT the user is basically treated like a data entry clerk. But a more modern approach, learning from consumer IT, is to focus on flow and simplicity and the ability to manipulate the data that is already in the system. My initial impression is that BPM 7.5 user interface is clean and well thought out. Funnily enough the web UI is crisper than the new IoS app, also unveiled at Impact. The new BPM release brings some consistency to a complex portfolio – 7.5 is a consolidation of more than 20 products. Thus Tivoli Identity Manager is now embedded in the product, without looking like a spare part. Of course flow is more than skin deep – a clean UI won’t improve a suite of poorly integrated products. It looks like Gilbert has been trusted with cleaning up the unwieldy bunch of tools IBM’s BPM-related tools had become, through years of both organic development and numerous acquisitions- with multiple workflow engines, repositories and user interaction models. IBM is never going to be a clean green field – which is what why ongoing decrufting is so important.